2017 Update: We’ve updated links below! Covvet: This takes the place of the dearly departed Shopping Notes, PoachIt, and Hukkster. The idea is simple: If you see a product you like, you click a bookmarklet on your desktop and tell the program what price you’d like to pay — then they’ll notify you if/when it goes on sale. I use this a LOT, and really like it — my only regret is that it doesn’t work on my iPad. Amazon Wishlist. A year or two ago, Amazon changed their wishlist so that it now can track products on ANY site. If they can match it on Amazon they’ll let you know; otherwise they link your list to the third party site. I have zillion gift idea lists in here; it also helps me keep track of all the makeup I want to try/investigate in person. Amazon Subscribe & Save: Maybe this is primarily a mom thing, but we use the Subscribe and Save store all the time to put things on auto delivery. We usually get a discount of 5-20% by signing up for a subscription, and it’s easy enough to skip deliveries or move them up. (What isn’t easy, though, is changing your delivery date — you may have to wait more than 30 days to do it.) In addition to the convenience, the prices are usually better than what we find in local stores, but you should definitely do some price-per-unit comparison before you commit. Ladies, what online shopping apps do you use? 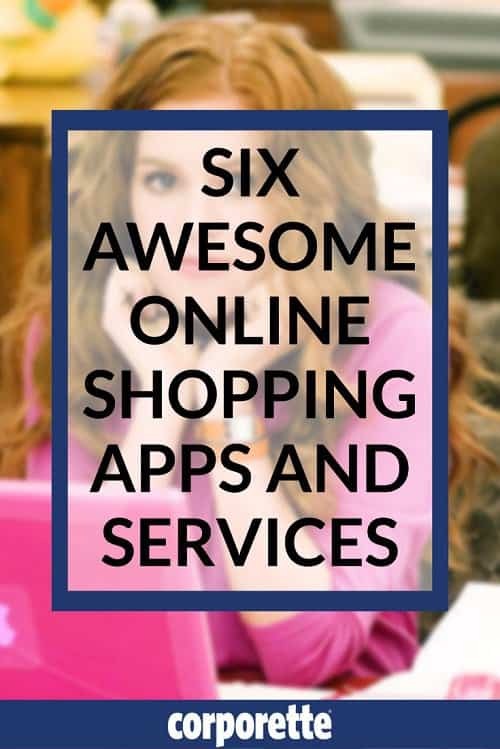 Do you have any other tips for online shopping? Pictured: Confessions of a Shopaholic via InStyle magazine. Based upon the races here and on other sites, I bought a Clarisonic Mia 2 for my acne-prone combination skin. I have been using it for two weeks with my normal face wash and have seen literally no improvement (if anything, my skin looks slightly worse with some small breakouts). I’m using it for the recommended time (I follow the automatic beeps) and I don’t think I’m using it too hard or deep. My face feels clean after I use it but having that clean feeling is not why I purchased it! I am hesitant to change my face wash (it’s amazing and the only reason my face generally looks clear, I’ve been using it for the past 5 years). Do I need to change the brush head? Or add something into my routine like an exfoliant? For reference, I’m using the acne brush but my clarisonic came with sensitive and radiant brushes as well. I have heard of (but never experienced) people whose skin “purged” after starting the Clarisonic, and had worse skin for awhile before it got better. I would give it another couple weeks but perhaps switch to the sensitive brush? What’s your facewash? I found the simpler the better and have used Cetaphil and Purity Made Simple (and a Fresh one that came with it). You shouldn’t use the Clarisonic with an additional exfoliant. So it’s not so much that my skin is worse, it’s more so that I just don’t really see much (if any) of a difference between using it vs not using it. My face wash is SkinMedica foaming wash – initially recommended by my dermatologist. I’m loathe to give it up because anytime in the past that I stopped using it, my skin got a lot worse in terms of oiliness and breakouts. I had this problem. I quit using it for several months and came back to it later (I planned to get rid of it but gave it another shot and it didn’t cause breakouts the second go-round). I use the acne brush heads and a similar face wash from my dermatologist. I don’t have any advice to stop the breakouts, but mine did eventually not cause them anymore. Maybe take a break and try again later? Once the breakouts did stop, the main benefit to me was the very very clean feeling after use– you mention you don’t care so much about that, so it may not be worth continuing. I always do a quick google of store name + Retail Me Not before placing an online order. Most times I don’t find anything, but once in a while it’s saved me $10 or free shipping or something like that. I always go through a shopping portal, usually United’s or Chase depending on which one has the highest returns. Note that on Chase’s portal that different cards get different rates so I check them all. I do this because I’m big into airline/hotel points. If I wanted cash back I’d try to go through ebates or something similar. The other thing I use is ShopRunner. I have a free membership with my Amex. Free 2 day shipping at a bunch of stores that usually charge shipping. I frequently use it for Eddie Bauer but the Limited, Lord & Taylor, and a bunch of other stores are on there. I use Slice but often my Amazon packages don’t show up with the exact tracking info. So I’ve made free accounts at USPS, UPS, and FedEx to track my packages. Bonus there is it lets me authorize them to leave packages at my door. I always go through a shopping portal, usually United’s or Chase depending on which one has the highest returns. Note that on Chase’s portal that different cards get different rates so I check them all. I do this because I’m big into airline/hotel points. If I wanted cash back I’d try to go through a cash back portal. The other thing I use is ShopRunner. I have a free membership with my Amex. Free 2 day shipping at a bunch of stores that usually charge shipping. I’m a really big fan of ebates, and I’ve earned about $100 in cash back from them over the past couple of years. Not a lot, I realize (the big fat check is only “big” in size! ), but better than nothing! They’ve partnered with a lot of places I order from, like Sephora and Bath and Body Works. I love how now, you can get your cash back via mailed check, or put it on a gift card and get it instantly – no minimum, they just send you your cash back balance every 3 months. I think direct deposit might be an option but I feel weird giving them my bank account info. My only complaint is that the gift card they sent me after I signed up was invalid, but it’s my fault for never contacting customer service. They also list current sales and promo codes, like Retail Me Not. You can also have your ebates money deposited into a Paypal account, which avoids giving them your bank account info! I’ve earned over $1000 back in the 3 or 4 years I’ve been using it thanks to being diligent about using it and maximizing their double cash back periods. And like Jitterbug mentions, they also accumulate promo codes so there’s no need to do a separate check of retailmenot, which I find is mostly just a lot of junk codes now. I’ve been using Ebates for 5 years now, and I’m up to $540 back. (I swear I don’t have a shopping addiction.) It’s so easy to use, and they also list relevant coupon codes. I’m actually disappointed when I want to buy something online and the site doesn’t work with Ebates. agreed on Ebates. I get PayPal payouts every 3 months, and i believe my next check is $300. The one thing I didn’t like about Ebates was having to remember to use it, but I’ve the chrome extension now, which helps a lot. Ebates + chrome extension is the best. I’ve earned over $1000 in the 7 years I’ve had it. I also use ebates. It’s just habit now and the money gets deposited into my PayPal account. Most of the time, the cash back is pretty modest but I use it as “fun” money to buy things I totally don’t need or to purchase little gifts for my husband that I don’t want him to see on Mint. Dad told me about camelcamelcamel which checks prices on AMAZON. He got a computer AT A VERY GOOD price by using the app. I think it is GOOD! Yay! Ellen is actually spot on w this. Camelcamelcamel is super helpful to track prices on Amazon. Kat (and others) what items do you use for subscribe and save? We just started a few months ago, but aside from diapers, wipes, toilet paper, etc, we struggle to think of things to add to get the 5 item discount. We added bandaids last time because the discount was more than the price of them, but I feel like we’re missing some obvious items.. I get this from Target, but it’s still a subscribe and save idea: makeup removing wipes. I use them on a near-daily basis so it was pretty easy to determine how far apart I should space my deliveries. I get toilet paper, paper towels, makeup removing wipes, soap, dishwasher soap, and laundry detergent delivered every 3 months. I have a bit of a paper towel stockpile, but usually start to run low on the other things before they arrive. also antiperspirant, bar soap, shower Fresh scrubbing bubbles, moisturizer, hand cream for very dry hands, disinfecting wipes, foodsaver bags/rolls, vitamins. Granted, I have so much on amazon subscribe and save, I really do have to check every month to see if I need to skip a shipment, but other than the napkins which I have enough to last a year or so even after giving several packages away, I’ve managed well, and I hardly ever go to Walmart. I love subscribe and save! I get diapers, pull up, wipes for the wipe container, travel wipes ( I love Amazon’s brand), baby shampoo, shampoo for me, shaving cream, dental floss, toilet paper, Lysol wipes, paper towels, dish soap, dishwasher detergent, trash bags, body lotion and coconut oil. I also do a lot of food items but have to check it more because the prices change more. I get individual mac and cheese cups, squeeze packs of applesauce, peanuts, bottled water, pasta, chips and whatever else is cheaper on subscribe and save that I might need soon. I follow jungle deals website for good ideas on what is on sale on Amazon and she post a lot of subscribe and save items. Honey is an app for Chrome that checks all codes out there – not just RetailMeNot – and applies the best one. So, it automatically determines if you get the 35% off of 1 product or the 10% off all bill or whatever. It’s pretty good. I forget I have it until it saves me money, yay.